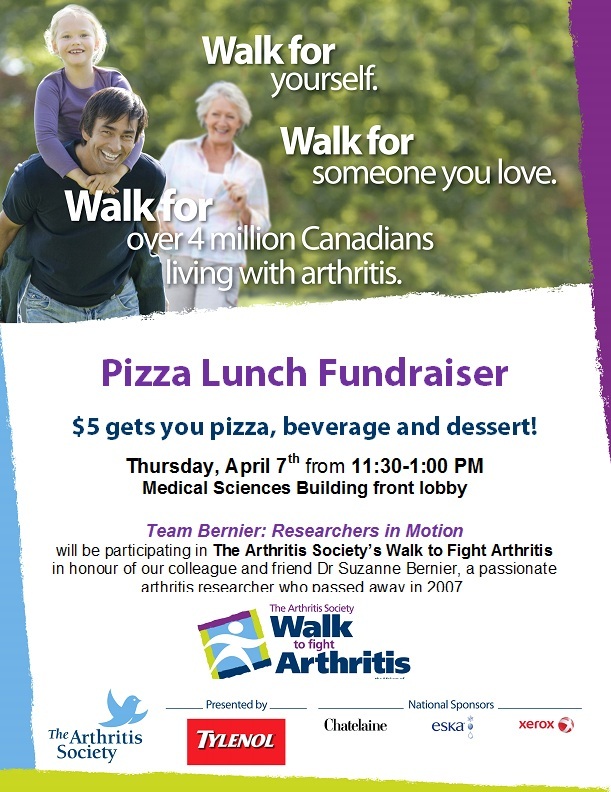 On Sunday, May 15, Team Bernier: Researchers in Motion will be participating in The Arthritis Society's Walk to Fight Arthritis in honor of colleague and friend Dr. Suzanne Bernier, a passionate Arthritis researcher who passed away in 2007. Dr. Bernier was a faculty member in the Department of Anatomy and Cell Biology and a founding member of the Canadian Arthritis Network and Western's CIHR Group in Skeletal Development and Remodeling. The team is walking and raising funds to support over four million Canadians who live with the pain and disability caused by arthritis and to support Canadian researchers who, like Dr. Bernier, have dedicated their careers to finding a cure for this disease. Over the past 60 years, The Arthritis Society has contributed over $170 million to arthritis research and professional training and has supported millions of people living with the disease. Funds raised allow The Arthritis Society to continue the important work that they do. Kicking off fundraising is a pizza lunch on Thursday, April 7th from 11:30-12:30 PM in the MSB lobby. The cost for a slice of pizza, pop and a cookie will be $5. Please come out and join us in raising funds for this event.